We are very lucky indeed that so many people within the removals industry are prepared to give up their valuable time and money to restore vehicles used in the trade from days gone by. This month’s story is no exception as we are delighted to publish a story about a truck that isn’t a conventional pantechnicon, but no less important for many – an articulated cab used for many years by Britannia Appleyards of South Yorkshire, pulling trailers for its living. 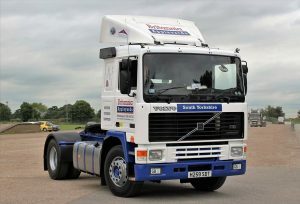 This lovingly restored Volvo F10 articulated cab unit belongs to David Appleyard. It was first registered on 6th November 1990 with registration number H 259 SDT and cost the princely sum of £28,000 new. It was fitted very early in its life with a fold out platform for tranship duties in Europe if needed. This is a very family orientated company, established in the late 1800’s in Conisbrough by the great, great grandfather of the current directors. They say that their Sunday dinners are more like board meetings! David said ‘This was our very first artic and was used on European work week in week out. The truck was retired from service in 2003 and parked away in the corner of the yard but brought back to life in our workshops by our fulltime fitter Trevor Kersey in 2015. The truck has covered an estimated 800,000 km up to now. In 2017 she retired for the 2nd time and will no longer pull a trailer on removals, but has helped out a local museum move its fire engines and helps out at Rotary Club events. Its duty is now that of a breakdown vehicle during the week and available for outings on a weekend with myself and my 5 year old. 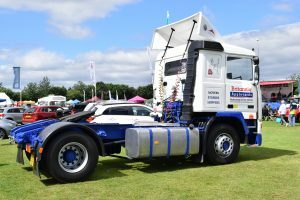 Over the last few years we have used it for Prom transport, transport for drivers to and from Truckfest at Peterborough and the Retro Truck Show at Gaydon and of course we support local shows wherever possible’. David went on to say ‘I remember waiting at the end of our street for my dad to arrive in it as it was customary as a kid to go for a ride in any new truck’. On his first outing through Rotherham, my dad managed to flatten many a cone. On day two, he drove it in to the centre of Sheffield to load up for a removal to France’. ‘Now Sheffield is a challenge with a big truck at the best of times, never mind an articulated lorry, and of course they managed to get stuck on a corner because of a parked car. Never to be defeated, the car was lifted on to the pavement by the crew and left there for the owner to deal with on their return’.